Ḥimyar was blessed with mountains that caught the clouds from the Indian Ocean and made them rain out. With clever dams and basins and channels, the water could be saved to make parts of Yemen very fertile, while others were rich in aromatics like myrrh. Axum did not have such generous rains, but it was not as dry in the rest of the year, and it had access to the African hinterland with gold and ivory and slaves and giraffes, and a different set of aromatics like frankincense. Both kingdoms could promise to protect sailors from robbers and provide markets and shipyards with some kind of reasonably satisfactory courts to decide disputes between merchants of different nations, and they taxed the route where cinnamon and cassia came from India to the Mediterranean. The kings of both countries put up inscriptions in Semitic languages, and in due course they converted to worship the god of Moses and thundered at each other for belonging to the wrong sect. 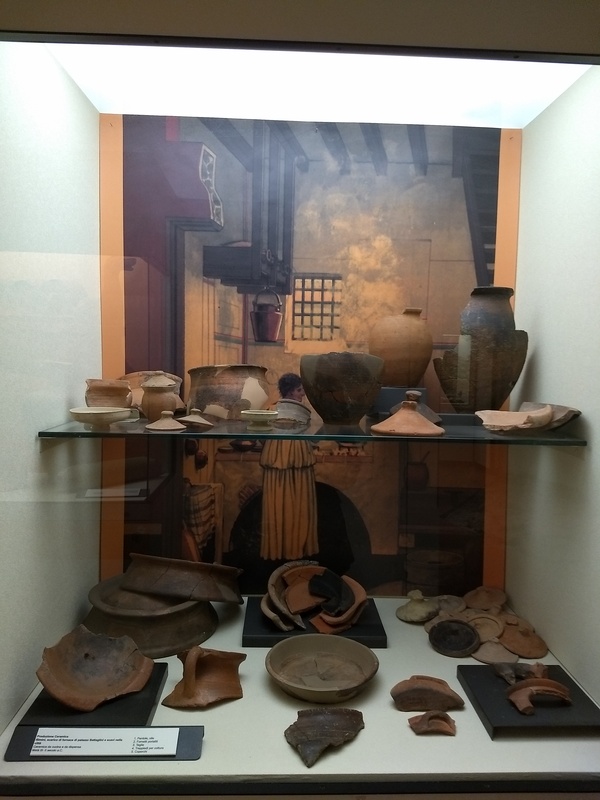 Most of this trade is visible in Italian potsherds in Sri Lankan middens, and Indian goddesses in curio collections at Pompeii. The countries along the Red Sea have had a hard history, and not even the Italians preserve everyday documents for more than a thousand years. Augustus boasted in his Res Gestae (chapter 26) that he had sent a naval expedition to Arabia Felix (and his general put up an inscription with his own name), but the locals proved able to defend themselves. There was also strife between dynasties and ethnic groups over control of the trade. By the 4th century CE we have church chronicles, and they record how king Kaleb of Axum crossed the sea and invaded Ḥimyar around 525. Professor Jorit Wintjes at Würzburg has looked at these sources, and discovered that they are one of the best documented maritime operations in antiquity: we have three or four detailed accounts from different perspectives within a century or two of the invasion. Chroniclers in the early middle ages tend to be more concerned with showing off their knowledge of the bible or Homer than with describing the details of combat, but these do mention the peculiar detail that the Himyarites defended the beaches with a system of chains strung between posts embedded in the ground. This would be the first use of beach defences, as opposed to chains closing a harbour mouth or rocks and stakes to prevent ships from approaching the sea wall of a city, in world history. Also, new inscriptions are continually being found and published, and it is always possible that a cache of documents similar to the Cairo Genizah will turn up in Yemen or Ethiopia. Archaeologists and epigraphers can’t do much about the troubles of Yemen and the Horn of Africa, but they can keep publishing and help make old finds better known. 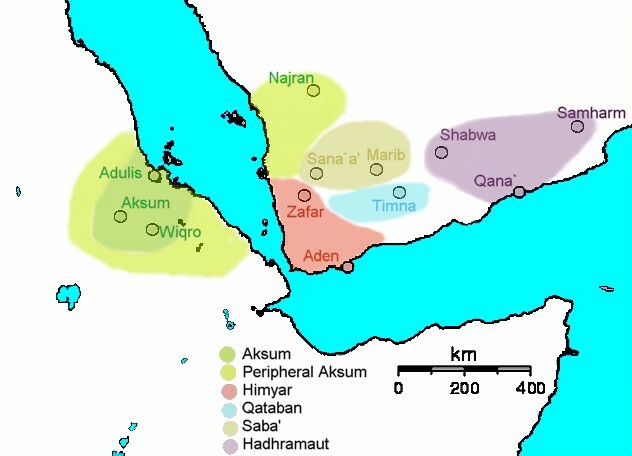 Further Reading: Wikipedia has articles on Himyar and Axum. If you know of other reliable online resources on this part of the world, please suggest them! Geocurrents has a piece on the island of Socotra with its dragonsblood trees and inscriptions in Aramaic, Brahmi, and Greek. This post was inspired by two talks at Innsbruck, and I will add the name of the first speaker and his new book on an inscription on the African side of the strait if I ever remember it.